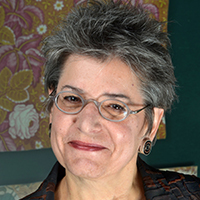 Linda Eaton is the John L. & Marjorie P. McGraw Director of Collections and Senior Curator of Textiles at Winterthur Museum and teaches in the Winterthur Program in Early American Culture and the Winterthur/University of Delaware Program in Art Conservation. After graduate work at the Textile Conservation Center and the Courtauld Institute of Art, she worked as a textile conservator in Scotland before coming to Winterthur. She has curated a number of exhibitions including Quilts in a Material World (together with a book of the same title), and many smaller exhibitions on embroidery including most recently Embroidery: The Language of Art (booklets associated with some of the exhibitions are available in Winterthur’s bookstore). She worked with Dr. Marla Miller to curate Betsy Ross: The Life Behind the Legend, and with Colette Loll on Winterthur’s recent exhibition Treasures on Trial: The Art and Science of Detecting Fakes. Her most recent book, Printed Textiles: British and American Printed Cottons and Linens 1750-1850, was published in September 2014.